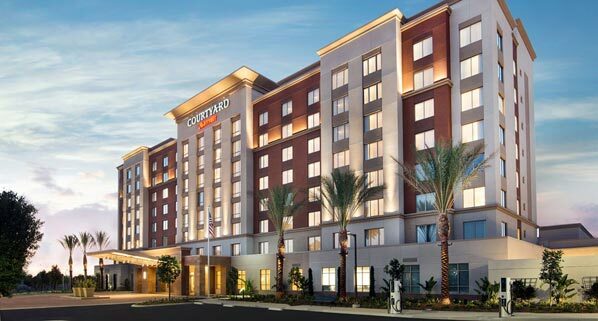 Marriott International has announced the grand opening of Courtyard Irvine Spectrum, a new property that offers a fusion of high technology with high style accommodations. Located at 7955 Irvine Center Drive, the eight-story hotel features modern arrangements for a stylish yet affordable stay, as well as comprehensive amenities to enhance guests’ experiences at corporate meetings and social functions. The 210-room hotel offers sophisticated spaces for guests to gather, meet, relax and recharge. Featuring more than 8,800 square feet of indoor and outdoor pre-function and event space, Courtyard Irvine Spectrum is equipped to accommodate meetings and events for diverse occasions. Its unique venues include a 2,300-square-foot event lawn, an elegant 5,000-square-foot ballroom, and a 446-square-foot classroom-style boardroom. Guests additionally have access to a variety of meeting and event planning services, including a certified wedding planner, on-site visual and audio technicians and custom catering. “We are delighted to expand Marriott’s presence in Southern California with the Courtyard Irvine Spectrum,” said Audun Poulsen, general manager of the Courtyard Irvine Spectrum. Courtyard Irvine Spectrum heightens hospitality with complimentary Wi-Fi and 40-inch smart TVs in every guestroom, including 14 suites. Accommodations also include large work desks with an ergonomic chair. A 1,620-square-foot fitness centre boasts CrossFit stations and TRX equipment, and outdoor recreation is just steps away with a 75-foot lap pool and whirlpool. Cabanas and a spacious lawn with a putting green make indoor and outdoor relaxation equally enticing. Courtyard Irvine Spectrum also offers electric vehicle charging stations. For convenient dining, The Bistro will serve breakfast and dinner, as well as offer local craft beers and dinner delivery service. Guests also have 24-hour access to the self-serve Market. Situated within close proximity to several tourist destinations, guests at Courtyard Irvine Spectrum will enjoy convenient access to Interstate 5, Interstate 405 and State Route 133 and Disneyland, Knott’s Berry Farm, Orange County Zoo and Segerstrom Center for the Arts.